Difference between revisions of "Lav'anre"
The information provided is dependent upon the verbal testimony of a traumatized individual. As such, it's veracity is hard to confirm, given the circumstance in which this young woman came into contact with the Dark Brotherhood. Both her parents are assumed deceased. There is no relevant data upon either individual recovered from the wreckage of the ship, and the child has refused to comment during any interview on the nature of their relationship. Of particular interest to those interviewing her, the Twi'lek has chosen to bear no family name, nor any name beyond that which was given to her upon her birth. Though she considers herself a disciple of Clan Naga Sadow, she does not consider herself beholden to any family or clan. She is a family of one. 1.61 m / 5' 3"
The earliest memories that Lav'anre possesses are the drone of a freighter's engines. Her father acted as a mechanic and trader to support his wife and daughter, meaning the girl saw little of the surface of many planets. The protective nature of her mother also enforced a cold, less-than-social nature in the child. Owning nothing of her own, and being allowed to keep little with her in a space she could call her own, the child became withdrawn even from her parents. Compared to any other youth of her age, she appeared an emotionless husk. Beneath this demeanor belied a very loving child- at least when it came to her own parents. She knew she had nothing of her own because they possessed so little. Her father seemed to have the mind of getting a job, completing a job and keeping flying, rather than sowing any lasting investments. Until her exposure to the Brotherhood in 35 ABY, she showed little more than an natural aptitude for mathematics and music. A freighter containing the unconscious form of Lav'anre and the corpses of her parents was found on the edge of the Orian system by Warhost forces. At the behest of then-Consul Sanguinius Entar, the child and ship were questioned and inspected respectively. The damage to the freighter appeared to be little more than that which might be experienced by pirates to hassle a smaller freighter- scorch marks and the like- before extorting the inhabitants for some quick credits. While this appeared a glance to be of a minor nature, a closer inspection revealed that the life support system had been damaged in the attack. It was little more than sheer fortune had saved the girl's life. Given an hour more, whether frozen or asphyxiated, Lav'anre would not have survived much longer. When the Proconsul heard of these events, he called for the teenager to be brought before him. The Corellian Sith told the girl that she had been chosen. Fate and the Force had chosen that she should survive the attack that had claimed her parents, he assured her. Sensing the Force in the girl, so now would he claim her as his apprentice. Smiling down at her he promised that she would possess strength if she so desired it. If she did not desire it, he continued, she would not survive the ordeal. From that point on, the pair have trained hard to sharpen her keen potential into a truly deadly weapon. Upon her Master's return, Lav'anre began to feel a wanderlust. She had so long grown used to the wandering of her youth that she became unable to remain upon Sepros. Though she did not express these feelings to Bentre, he seemed to understand her need. He ordered her to train on Tarthos. The girl's arrival on the planet coincided with the orchestrated purge of so-called disloyal forces. Unlike her master, Lav'anre saw an odd sort of wisdom to the actions orchestrated by the Ragnosian Quaestor. While she refused to pledge herself to Kojiro Keibatsu, she joined in on the purges. When news of her actions reached the then-Proconsul, the wrath of Bentre was turned upon her. Whereas her training had been merely demanding, she found her new training regiment pushed her boundaries and forced her to grow far in strength far faster than before. At first, she found her efforts a struggle but as she began to embrace the rage she had previously held in her chest, she found a new strength. While the older Sith fully understood what was occurring, young Lav'anre did not yet fully comprehend the slope toward the Dark Side she now walked. As the Clan found itself thrust from its home system, the girl found herself bouncing between ships belonging to both the Clan and Houses as needed. She was sent on missions to scope out the assets and resources that could be acquired at various points of interest, as well as scouting out potential Collective targets. The true proving ground for Lav'anre was at Meridian in 36 ABY. As her master took on the reins of the Clan leadership, the girl found that her training grew more and more strained. Less time was devoted to training her, when instead her efforts could be directed toward the support of the Clan. This left the girl somewhat separated from the mainstay of the Sadowan efforts at the Collective's space station. While she found herself caught up in the final actions before the Brotherhood's victory, it was not without casualties. While she emerged from the fray with only minor injuries, the darkness inherent in the galaxy was revealed to the Twi'lek. It was a darkness that transcended the mere constraints of the Brotherhood or the Collective. Rather than holding tight to her peers, the girl chose to walk a quieter path. Despite the success against the Brotherhood's chief adversary, she became convinced that she was a totem, bound to bring death to anyone she might care about. Resolving to depart the Sadowan fleet after reporting in and expecting the worst, Lav'anre was instead greeted with bittersweet thanks by her master. For her bravery despite the breadth of her fear and her own inexperience, Stahoes believed she had been tested by the forge of battle, and had been found satisfactory. She was presented with a lightsaber to call her own and elevated to Knight upon her return. The elevation was with less pomp and circumstance than she had seen showered upon lesser students. Yet, she was given a freedom of reign on how she would continue. Taking the opportunity, the former apprentice requested a chance to act as eyes to the Brotherhood. No longer a mere student, she would serve the interests of the Clan, more as a soldier and scout than a typical Disciple of Sadow. Soon after her ascension, the Consul took up the stewardship of another student. She was no longer so tightly bound to her master. She was the master of her own fate. Feeling no particular loyalty to a master who would cast her aside so easily, Lav'anre decided to spirit away to whatever elements of the Clan she felt inclined to. She recognized the danger of returning to the wild nomadic life of a spacer again with the Collective threat. As a Force-sensitive, she was as in danger out there as she would be sticking with the Clan. To this end, she began to work more easily and willingly with elements of the Shroud and ACE of the larger Brotherhood. The calls from "home" could still bring her back to roost, but the question of a price always springs to mind even when she helps out her so-called "fellow" Sadowans. 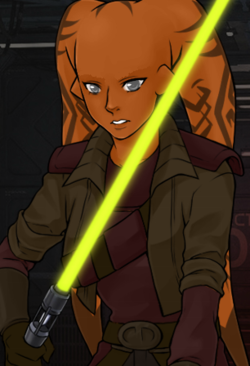 A sandy-orange Twi'lek, Lav'anre might appear non-assuming at a glance. Despite her diminutive height and lean frame, she can often be found wearing simple, functional clothes: a pair of worn pants and a tank top typically covered by an old Rebellion-era jacket bearing the Rebel crest. A knife or blaster is usually worn on a belt holster at her side. Looking into the young Twi'lek's dark-brown-green eyes, you would see a weariness beyond her years, a hardness in her gaze. As her relationship pertain to the Brotherhood and her Clan in particular, there is little to work with. One thing that does seem clear is that the woman seems to hold her former 'master' in cold disregard. She learned from the man readily enough, but she possessed nothing like appreciation or gratitude for his acts. It can be assumed that she viewed him as little more than a tool. It has been speculated by Stahoes himself that she may just be hurting from the recent loss of her family while she studied beneath his care. Despite his relatively understanding nature, her Master attempted to reel the girl in so she might better serve the cause of Sadow. She grew to resent his actions over time, keeping her tongue for a time while in the man's presence. The Twi'lek recognized that there was still something to be learned from the man, if she can only keep herself alive and well. As her master stepped up to the office of Consul, she found- to her annoyance- that his attentions were spread out to a greater degree. She determined she would have to work harder to keep the man's attention. After all, she reasoned to herself, wasn't having the Consul's ear tilted toward you the quickest path to power? These thoughts and feelings were shattered when she returned to find herself- as she saw it- replaced by a fresh, plucky new apprentice. Freed from Stahoes by her Knighthood, Lav'anre turned away from her former master, displaying disgust and disrespect. While still markedly detached, Lav'anre previously connected somewhat with her former master's wife. There was a connection between the two that is warm, almost as though the young woman viewed Tasha'Vel as some sort of surrogate mother figure. This warmth does not translate into the training that occurred with the two in a student-mentor fashion, however. There is still a cool almost-disinterest that flows from the younger girl toward her elder. While she may hold Tasha'Vel in higher regard, she does not consider herself a member of their family and has expressed no interest in such a relationship with the family. Instead, she has chosen to continue holding no name but her own. She has had little contact with Tasha'Vel since her ascension to Knight, so the exact nature of her feelings or relationship with the Rollmaster remain unclear. Though their contacts thus far have been few and far in between, any adult could recognize the jealousy that Lav'anre holds for Syntari. The Twi'lek believes that she is more deserving of the honors and duties that are afforded to a member of the Black Guard, while failing to recognize the work or dedication inherent in undertaking such a position. To the mutual good of both the Umbaran and Twi'lek, their contacts are still few and far in between enough that the anger felt has not had the opportunity to be sharpened by constant contact between the two. Much as in her childhood, she possesses little of her own. This is now more as a result of her training than any machination of the Brotherhood or its members. She is not denied anything expressly, but rather has taken after her mentor's seemingly bare-bones mindset. She keeps a beaten armory lightsaber, a few sets of simple clothing furnished by the Brotherhood, a vibroblade and a knife. Such an existence is simple. Once La'vanre becomes stronger, she has promised herself, she will have everything she could want. Through intense training since her being apprenticed, the young woman has become familiar with the basics of lightsaber combat, bladed weaponry, has been drilled on the basics of diplomacy and tactics and continues to sharpen her mind. She has received training from both Bentre and his wife on a variety of subjects in order to better round out her education. While Stahoes has insisted that he teach the girl everything he learned from Master Turelles, the Versea family's Matriarch has ensured that Lav'anre is able to do more than to follow in the shadow of Stahoes. Thanks to this the young Twi'lek became a more well-rounded student than her master. Once Knighted, she continued her training in a much more subtle manner, choosing to learn through her experiences and failures rather than books, training or teachers. This page was last modified on 20 January 2019, at 04:47.